A good leader is able to listen. This is particularly challenging for them because they are expected to be directional, charismatic, courageous, leading everyone forward, making the difficult decisions, and determined. In short, they are expected to have a vision and an opinion and be vocal about it. However, in order to be all of those things and achieve greatness as a leader, you need to know what is happening in your organisation. What is truly happening. If you’re not able to listen to people, all those other qualities are redundant; you are leading based on a false picture and your vision and goals will eventually flounder and fail. To listen effectively you must clarify your understanding of others, of the people you need to listen to. Know the world your followers live in; really know it. Let me share a real example. I know a Chief Executive of a Health Board who, once a month, shadows someone in his organisation. It varies from being an orderly on a ward to a cook to a janitor to a consultant to reception staff. He “sits” with them for a day watching them work, listening to them as they talk about their work. This simple act, religiously done once a month, gives him a tremendous amount of knowledge about his people and his organisation; far more than sitting in lots of meetings and just directing. He really understands how his people think, the world they live in and what they feel about it. This enables him to go back into a position of authority with valuable information so he can make informed choices about his organisation. This is integral to him being an effective leader. Comparing yourself. This is where, as soon as someone starts talking, you think either, “Ooh, I’m not doing as well as that person” or “I’m doing so much better.” Whichever it is, you have stopped listening to them. Mind reading. You assume that you know what that person is going to say, so you have mentally checked out of listening to them. Filtering out what you don’t want to hear. What they are saying doesn’t fit your view or what you need to hear, so you somehow don’t hear it. 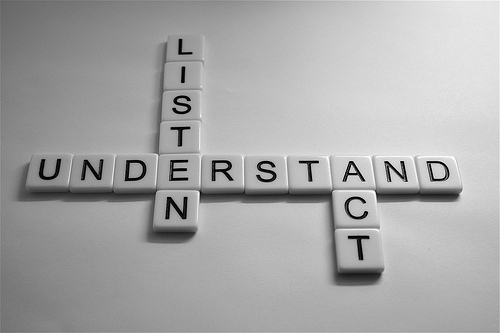 The more that you can develop active listening skills the better a leader you will be. I believe that this should be compulsory for any leader – take part in a coaching training course. When you become a coach you HAVE to listen. The number one thing that you learn as a coach is to listen from a point of objectivity so that you’re not giving opinions or information or advice. You are truly listening. Even if you have good listening skills, brush up on them. There is always more work to be done. Listening is not a “nice to have” leadership skill; it’s essential. Make sure yours is the best it can be. Emma Falkner works with leaders to help them be the best they can. If you’re a leader and interested in improving your listening skills, then contact Emma to see if there’s a coaching training course running that’s suitable for you or to discuss creating a course for you and other leaders in your organisation.